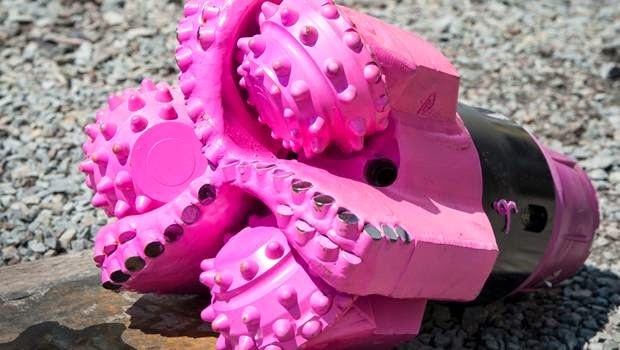 Haynesville Play: The Haynesville Shale Resource: Pink Drill Bits? Every October I play a parlour game to guess what unusual new thing will get "pinked" for Breast Cancer Awareness Month. Drill bits might be this year's winner. Baker Hughes, in a promotion deal with the Susan G. Komen organization, is distributing pink drill bits this month. After a few weeks of so much pink (especially during NFL games), I get a bit cynical and see it more as a bunch of marketing managers getting on board with a popular brand (and visa-versa). Don't get me wrong, I am very appreciative of the funding and attention that Komen has brought to the treatment of breast cancer over the past couple of decades. I feel especially hypocritical saying this because my family has been a direct benefactor of this progress. But after a while, it feels that this one cause is sucking all the air out of the room when the world is full of other worthy causes that unfortunately don't have such a ready-made marketing angle.